For the second consecutive game, Ricky Rubio sat out with what is being described as ankle soreness. It is the sixth game he’s missed of this 17-game season. The Wolves are 7-4 with him and now 1-5 without him. The only Rubio-less win came on Friday night against the Kings who did not have DeMarcus Cousins, their only great player. The Wolves cannot realistically compete against good teams without Rubio, so a reasonably-close loss (they beat the spread by 1.5) has to suffice. On Saturday, Jerry Zgoda of the Star Tribune wrote that Rubio “began to experience that soreness two or three games ago, then jammed the ankle just before halftime in Wednesday’s home win over Atlanta.” According to Darren Wolfson of KSTP — as reliable a Minnesota-sports beat reporter as there is — Rubio wants to play, but is being held out per the decision of others. In both the Hawks and 76ers games — the last two that Rubio has played in — he has looked every bit his usual self, having a noticeably-positive effect on both games, particularly on defense. The only evidence of injury concerns was the wrap he put on his leg during his stints on the bench. As was the case last season when Rubio was being held out of games that he reportedly wished to play in, he can be seen going through pregame work with assistant coaches, demonstrating no apparent disability; at least not to my untrained eyes in the times I’ve witnessed it. Rubio was described as a “gametime decision” today, but nobody paying attention believed he would play after that much was announced. It feels the same as last year, when his ankle never gets better despite the passing of time. This leaves us with two general possibilities, and you can decide for yourself which is better or worse, and more or less likely: either Rubio’s ankle has not recovered well from the “diagnostic” surgery that he underwent back in April, over 7 months ago — a procedure described as minor and “clean up” — and he is increasingly unreliable as a healthy starting point guard, or he is able to play but the Timberwolves don’t want him to. The latter sounds like a juicy conspiracy theory, until you consider a few different things. First, the Wolves used this precise tactic last year with great success, when the franchise goal was to lose games and improve draft position. They sat Rubio out and subbed in the 19-year old shooting guard, Zach LaVine. The rookie had no idea how to play point guard, but he had endless athleticism and general potential as a player. His on-the-job basketball training doubled as effective tanking. Rubio was held out of 60 games due to ankle issues. They were 7-15 in the games in which he played, and 9-51 in the games in which he sat out. The 26-win pace with Rubio would’ve placed the Wolves between Orlando and Sacramento for the 5th worst record in the league, and 5th best odds of winning the lottery. Holding him out led to the lottery win and budding superstar Karl-Anthony Towns. On draft night, after selecting Towns, Flip all but admitted to the tanking in his remarks to the press, made with an ear-to-ear smile. Second, the Wolves have another tanking incentive this year. No, they will not be bad enough to draft at the top again; not without incredible Magic/Webber or Bulls/Rose type of lottery luck, anyway. But the Wolves owe their first round pick to the Boston Celtics, unless it falls inside the top 12 of the draft. Why do they owe this pick, you ask? Well, because David Kahn included it in a trade with the Suns that sent out Wesley Johnson’s contract. That’s right, the Wolves had to pay the premium of a protected first round pick in order to unload the salary of the player drafted ahead of DeMarcus Cousins and Paul George. Importantly, if the Wolves keep the draft pick this year, they do not owe a first rounder for that trade and it instead becomes a pair of second-round picks; a much lower cost. Also importantly, the Wolves owe their 2018 first-round pick to the Hawks as partial consideration of the Adreian Payne trade. In other words, they risk losing 2 first rounders in 3 years if they win too much this year. Since we last posted, the Wolves have played three times. They won at Miami in another impressive road performance. By this early stage of the season, these young Timberwolves have now defeated the best Eastern Conference teams outside of Cleveland: the Bulls, Hawks, and Heat. The next night, in an always difficult second end of a back to back, they narrowly lost to the Orlando Magic. In both games, Andrew Wiggins and Karl-Anthony Towns gave Wolves fans more to be excited about. Wiggins continues to produce points with aggressive drives to the basket that often end in thunderous dunks or free throw attempts. Towns is playing at a higher level than any NBA rookie in recent memory. The future here is obviously bright, if for no other reason than the Wolves have Wiggins and Towns. Last night, the Wolves lost another home game – they remain winless at home – this time to Stan Van Gundy’s Detroit Pistons. Detroit did not play particularly well on offense in the first half, but seemed to have the Wolves’ strategy mapped out well and exploited its limitations, such as the inability of Tayshaun Prince and Kevin Garnett to threaten defenses. Probably more than any other time this season, the limitations of those two cagey veterans has people wondering if Sam Mitchell should consider a lineup change. Beyond that issue, the Wolves got bad performances from the second-unit front line. With Nemanja Bjelica out nursing a knee contusion, the combination of Adreian Payne and Gorgui Dieng struggled. Each player has a good motor and athleticism that suggests an upside might be in there somewhere, but each also tries to do too much, too often. Instead of making simple rotation passes to more competent playmakers, Dieng and Payne like to hold the ball for a moment or two, and try to initiate a play of their own. The results are usually not good. In any event, the Wolves are now at 5-8, and host the winless Philadelphia 76ers on Monday night at Target Center. It’s a game they will be predicted to win; probably by double figures. As a way to keep the conversation moving, and without any new hot takes or conspiracy theories about Wiggins struggling to score or Rubio sitting out with injuries, I thought I’d just run through the roster of players and identify something good, and something bad, in the stats about their play, to date. GOOD: On/Off Differential of 13.1 points per 100 possessions. As always seems to be the case, the Timberwolves play much better with Rubio on the floor than they play when he is on the bench or sidelined in street clothes. So far this year, Rubio has played 277 minutes. In that time they outscore opponents by 7.0 points per 100. He has been off the floor for an unfortunately-large 357 minutes. In that time they were outscored by 6.1 per 100. Whether Rubio plays determines if the Wolves are a good team or a bad one. BAD: Field Goal Percentage of 36.3. Rubio’s shot is not going in, and — notwithstanding that first game against the Lakers — does not look different in any significant way than it did in years past, before his well-documented work with Mike Penberthy last year. Sometimes when Rubio catches a pass with an open, seemingly good shot for the taking, there is a palpable hesitation in his slow setup, as if (R. Kelly voice) ‘his mind is telling him no’ the whole time before he finally, slowly releases an errant shot. That is no way to play and he’ll never be any good at shooting if he doesn’t want to take shots. What is going on with Ricky Rubio? That the Timberwolves do not think of Rubio as one of the franchise’s top three talents. Taking that number literally causes you to start listing possibilities for who might be ahead of him on the franchise-importance pecking order. Andrew Wiggins would come to mind first. He was the top pick in the 2014 Draft and cruised to Rookie of the Year honors. Karl-Anthony Towns, even if he hadn’t played a game yet, would probably be second. He was also a number one pick, and many feel he has potential even higher than Wiggins. Neither of those would be unreasonable assessments, given their enormous talent and potential. The likely third choice is more controversial. Contrary to the hard basketball-performance evidence to date, I think there’s a strong chance that the other player the Timbewolves higher ups prioritize ahead of Ricky Rubio is second-year guard Zach LaVine. The handling of LaVine has been a source of ongoing debate among Wolves fans and pundits, and it has evolved in a number of different ways since he was drafted out of UCLA where he played just one year, coming off the bench. I don’t need to detail the history again, but the short version is that the Wolves entered last season with expectations of playing competitive basketball, but then used Ricky Rubio’s early-season ankle sprain as cover to tank for the next draft, and by far and away the most effective tanking weapon at their disposal was playing LaVine at point guard. Had the Wolves played Rubio 40 or 50 games last year instead of 22 — and if you ever watched Rubio working with special shooting coach Mike Penberthy on gamedays, drenched in sweat after cutting-and-shooting drills, you probably agree with me that he was capable of playing — they would not have Karl-Anthony Towns today, which would make their future much dimmer than it is now. But along with sitting Rubio to lose games, it also allowed them to play LaVine a ton of minutes; 1902 to be exact. That was third most on the 2014-15 Timberwolves. In some broad, basic ways, it was a successful season for LaVine. He logged all those minutes, scored 778 points (on a not-terrible 42 percent shooting) and earned second-team All-Rookie Team honors. 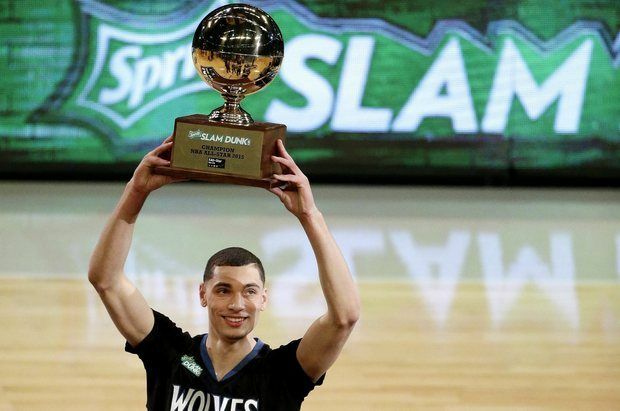 Add to that the celebrity status he attained by blowing away the field in the Slam Dunk Competition, and there was a lot for the Wolves and LaVine to feel good about, after his first season was complete. A more detailed assessment of LaVine, however, is not favorable. He has played most of his minutes at point guard where he does not effectively run an offense. He is also, at this point, an inept defensive player whose mere presence on the floor — contrasted with Rubio — causes the Wolves to lose games instead of potentially win them. Very few would argue with those critiques, at this juncture. More debatable is how high his potential is, and what might be the best way to develop it. Before Flip Saunders was tragically and unexpectedly stricken by cancer, the subject of Zach LaVine’s future was presumably a frequent and high-importance subject of front office discussion. This history brings us to the present, where Ricky Rubio has now missed the last 4 games — 40 percent of this short season — due to what is now described as a hamstring injury. (When he missed his first game against the Charlotte Hornets, it was called a knee injury.) Right before the home game against Charlotte the Wolves had unexpectedly won at Chicago and Atlanta, beating two of the very best teams in the Eastern Conference on their home floors. They were two games over .500, and reshaping the expectations for what all of a sudden figured to be a more competitive season than fans anticipated. We have a Zach LaVine issue. He’s been playing a lot of minutes at point guard and many feel that this is a bad idea. The Wolves are winning more than most expected before the season (4-5 record, as of last night’s loss at Indiana) but possibly less than they could’ve, if LaVine played fewer minutes at the point. It’s a difficult question — whether playing him there makes any sense — and probably not answerable within a great deal of certainty. LaVine is not good at point guard; not yet anyway. He is not a strong enough ball-handler to initiate good team offense, and he is a very, very poor defensive player, when tasked with defending point guards. Eric in Madison of Canis Hoopus wrote an outstanding piece this morning that details why playing LaVine at point guard has been a losing proposition for the Wolves this season. I strongly encourage readers to click through and read his piece, if you have not already. He is an unbelievably explosive athlete; possibly the greatest leaper in the history of the game. LaVine’s performance in last year’s dunk contest rivaled the best ever, including Vince Carter’s 2000 exhibition that many thought could never be topped. If in this year’s contest he tries to dunk from the high school three-point line, I won’t be completely surprised. LaVine, though very skinny and in need of more upper body strength, sometimes blows past a defender with a first step that leaves people wondering what might be in store for him if he ever learns the nuances of the game. His physical upside as a guard who destroys defenses off the bounce seems unparalleled. LaVine has had some success playing off the ball, in his short NBA career. Last night at Indiana, he played much better next to Andre Miller, and eventually ended the game with a not-at-all-shabby line of 26 points, 6 rebounds, and 4 assists. His plus-minus was a net-zero, and without digging into the details I’m sure that it was decidedly positive when he was playing at the two instead of the point. After the All-Star Break last season, LaVine shot a clean 38 percent (38 out of 100) from three-point range, and of those, 34 were assisted. (Also, for what it’s worth 32 of them were “above the break” threes, farther out and more difficult than threes shot from the corners.) Making assisted threes is a valuable shooting guard skill, even if it isn’t necessarily the play that best signifies Zach’s upside. Are all of these point-guard minutes in NBA games the ideal way to develop his game for the future? Would it make more sense to play him more at shooting guard in NBA games? Would it make more sense to give him point-guard minutes in a D-League setting? How much do in-game minutes matter for development, as opposed to developing in practice? Is LaVine at point guard stunting the potential development of the players who share the floor with him? Players like Shabazz Muhammad, Nemanja Bjelica, and Gorgui Dieng? Could this Timberwolves team fight for a playoff spot, if Ricky Rubio quickly returns to full health and they move forward with a better use of the backup point guard minutes – either via a minor trade or simply playing Andre Miller over LaVine? Final score – Warriors 129, Wolves 116. Fun game, champs still look like champs. The Warriors used to be the team of counterintuitive truths, the one that went against old conventions. They built an offense around a skinny 6’3″ jump shooter. Instead of trade for Kevin Love, a 26 & 12 superstar, they thought it made more sense to hold onto Klay Thompson and Harrison Barnes. Instead of starting Andre Iguodala, a recent All-Star and First Team All-Defense performer, Coach Steve Kerr thought it made more sense to start Barnes, a significantly worse player at that time. David Lee was likewise a former All-Star, and was the team’s highest paid player. When Lee suffered an early season injury, Draymond Green took his spot and never gave it back. Green was a second round pick making less than a million dollars a year. There are a lot of ways that Mark Jackson’s and then especially Steve Kerr’s Warriors have bucked conventional wisdom in becoming what appears to be an all-time great NBA basketball team. Now, we’ve reached a point where the wisdom of those decisions and tactics are long past doubt. Curry is not just a great shooter, but a great player; quite possibly the best in the NBA today. Instead of last year’s MVP being some type of fluke, it seems more likely that it is the first of more to come. Kevin Garnett compared Curry to Michael Jordan yesterday, saying both were like this “whole other thing,” that is beautiful for basketball. He’s not wrong. Curry had 46 points last night, shooting 8 of 13 from downtown. When dribbling off of ball screens way out court — 26 or more feet from the hoop — Curry draws double teams. He’s plenty clever as a dribbler and passer, so this early action inevitably leads to the screener receiving the ball with a scrambled 3 defenders trying to stop 4 Warriors. Green is often times that roll man, tasked with setting up the score. And last night, he could hardly have done a better job of doing it. A bulky 6’8″ former college center, Green has become the most versatile player in the NBA. He can defend all five positions, he can shoot from the perimeter, he can post up, and — maybe more than anything — he can facilitate offense for his teammates, off the dribble. When he catches that roll pass from Curry, and it’s 3 against 4 for the defense, Green is looking to the corners for three-point shooters, or up high to Festus Ezeli for a lob dunk. Last night, he made both passes look effortless. The lobs were dunked. The kick-outs were converted for threes. Green, the former second-round pick, had 23 points on 8-10 shooting, to go along with 8 rebounds and 12 — TWELVE — assists. He’s become undeniably one of the best forwards in the league. Last night, the Wolves played their second straight game without Ricky Rubio, who is battling a sore hamstring. When this “gametime decision” was announced, a great deal of the excitement for this matchup was drained. The Warriors — 9-0 and coming off another big win at Memphis — are bound to lose a game eventually and these upstart Timberwolves playing on more rest seemed like a potentially sneaky and fun team to hand them their first L. Without Ricky, that simply was not possible. Rubio’s replacement, Zach LaVine, is one of the worst defensive point guards in the league, and the Wolves had no chance with LaVine defending Curry. Had Coach Sam Mitchell instead put Andrew Wiggins on Curry, and had LaVine guard Barnes, it’s possible some of the damage could’ve been mitigated. But Mitchell has been pretty clear on the LaVine issues in terms of what he’s trying to accomplish with him this year; it is about development — even in the middle of real games — more than it is about short-term strategies for team success. In Mitchell’s plans, LaVine had the good learning experience of defending Steph Curry MVP last night, which is more important than the Timberwolves trying to win that game. Curry had 21 points in the first quarter, most of which came on LaVine. The crowd mixed oohs and ahhs, with groans of frustration.